Add the rice, water, kidney beans, black beans, corn, tomato sauce, picante sauce, taco seasoning, salt and pepper into the slow cooker. Stir a bit. If desired, place chicken on top of mixture. Cut up chicken and then stir it back in to the pot. Make the garlic lime sour cream by stirring together sour cream, cilantro, lime zest, lime juice, kosher salt and garlic cloves. 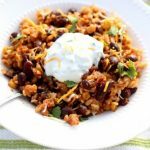 Serve rice and beans with a dollop of the sour cream on top. Sprinkle with grated cheddar, if desired. Store leftovers in an airtight container in the refrigerator for up to a week or in the freezer for up to 3 months.